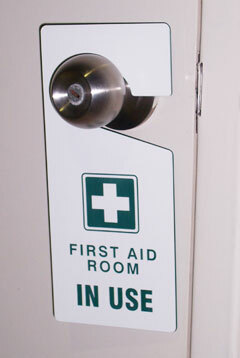 Door hangers are the easy way to convey a short message on your door. 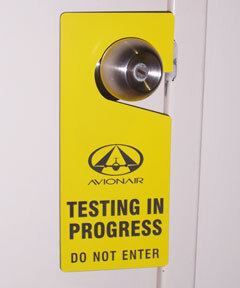 You might need some privacy and not be disturbed, or welcome to come in, or warn of a hazard..
Our door hangers are made tough. The message is engraved into the plastic so won't rub off with use. 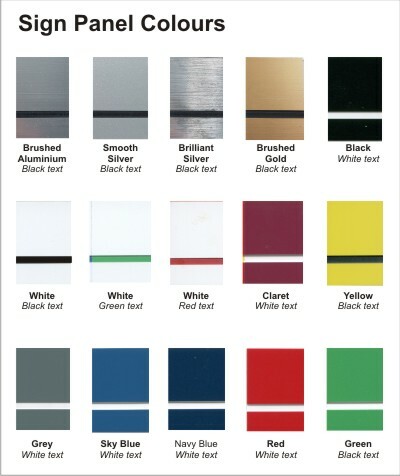 Available in a wide range of standard colours and can be engraved with your choice of wording or message. 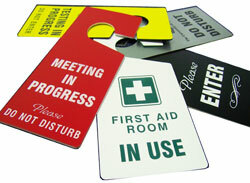 Our standard size door hanger measures a generous 100mm x 230mm making them ideal for use in commercial environments. They are designed to fit over most door handles. * Price includes GST and engraving of text only. Additional artwork setup & engraving fee may apply for images or logos. Discount available for quantity purchases. Simply send us an email with the details of the sign you are interested in, how many signs you require, the text or graphics you need included in the sign layout, and colour preference. Also include your contact and delivery details. We'll then email you a copy of your order so that you can arrange payment. Sign orders need to be paid for in full before any engraving work can commence.